The ankle region is frequently involved in juvenile idiopathic arthritis (JIA) but difficult to examine clinically due to its anatomical complexity. The aim of the study was to evaluate the role of ultrasonography (US) of the ankle and midfoot (ankle region) in JIA. Doppler-US detected synovial hypertrophy, effusion and hyperemia and US was used for guidance of steroid injection and to assess treatment efficacy. Forty swollen ankles regions were studied in 30 patients (median age 6.5 years, range 1-16 years) with JIA. All patients were assessed clinically, by US (synovial hypertrophy, effusion) and by color Doppler (synovial hyperemia) before and 4 weeks after US-guided steroid injection. US detected 121 compartments with active disease (joints, tendon sheaths and 1 ganglion cyst). Multiple compartments were involved in 80% of the ankle regions. The talo-crural joint, posterior subtalar joint, midfoot joints and tendon sheaths were affected in 78%, 65%, 30% and 55% respectively. Fifty active tendon sheaths were detected, and multiple tendons were involved in 12 of the ankles. US-guidance allowed accurate placement of the corticosteroid in all 85 injected compartments, with a low rate of subcutaneous atrophy (4,7%). Normalization or regression of synovial hypertrophy was obtained in 89%, and normalization of synovial hyperemia in 89%. Clinical resolution of active arthritis was noted in 72% of the ankles. US enabled exact anatomical location of synovial inflammation in the ankle region of JIA patients. The talo-crural joint was not always involved. Disease was frequently found in compartments difficult to evaluate clinically. US enabled exact guidance of steroid injections, gave a low rate of subcutaneous atrophy and was proved valuable for follow-up examinations. Normalization or regression of synovial hypertrophy and hyperemia was achieved in most cases, which supports the notion that US is an important tool in the management of ankle involvement in JIA. The ankle region (ankle and midfoot) is frequently diseased in juvenile idiopathic arthritis (JIA) [1, 2] but the anatomical complexity of this area makes it difficult to evaluate clinically which of the numerous joints and surrounding tendons are involved in the inflammatory process. Several publications in adult rheumatology have shown high sensitivity of ultrasonography (US) for early detection of synovitis in various joints including the ankle [3–11], but there are only few reports dealing with pediatric rheumatology [12–14]. Intra-articular steroid injection is a treatment option for JIA patients with mono- and oligoarticular involvement or whose joints remain active during systemic treatment . The clinical response to a palpation-guided intra-articular steroid injection is however poorer in the ankle than in other joints [16, 17], which may be due to the anatomical complexity of this region preventing accurate placement of the needle tip. In the present study, we investigated the usefulness of US of the ankle region in children with JIA for detection of synovial hypertrophy and hyperemia, for guidance of steroid injection and for assessment of treatment efficacy. The study was conducted over a period of 2.5 years at the Department of Pediatrics (Rigshospital) of the University of Copenhagen, Denmark. Forty ankle regions were investigated in 30 JIA patients with active disease, as judged by the treating physician. Twenty-one patients were female (70%), 9 male (30%) and the median age of the patients was 6.5 years (range 1-16). Eleven of the children had poly-JIA (median age 10 years), and 19 oligo-JIA (median age 5 years). Demographic features, clinical and laboratory assessment are listed in Table 1. The study was approved by the local research ethics committee (Videnskabsetiske Komiteer for Region Hovedstaden), and all parents gave informed consent for the participation of their children. During the study period, an initial Doppler-US examination was performed (week 0) in all consecutive JIA patients with a clinically diseased ankle region. US revealed signs of synovitis in a total of 36 patients, 10 with involvement of both ankle regions. Six patients were excluded due to non-participation at follow-up, leaving 30 patients and 40 ankle regions for evaluation. At inclusion 26 patients had ongoing systemic treatment, 15 with methotrexate, 6 with methotrexate and biologics (3 etanercept, 2 adalimumab and 1 abatacept), and 5 with systemic corticosteroids. Four patients received an intra-articular steroid injection within the previous 3 months, but not in the same extremity. The pediatric rheumatologist and the radiologist made consensus decisions based on both clinical complaints and imaging results regarding which compartments to inject. Patients diagnosed with JIA, based on the revised criteria of the International League of Associations for Rheumatology (ILAR, 2004) , were examined by one of two experienced pediatric rheumatologists for clinical signs of involvement of the ankle region. Recorded clinical variables were: swelling, pain assessed by the patient/parent (Visual Analogue Scale, VAS), tenderness at palpation and limitation in the range of motion. Patients with clinically active arthritis (swelling or limited range of motion with pain or tenderness) were assessed with US on the same day. The US examiner was a radiologist specialized in musculoskeletal US using a GE Logiq 9 scanner (General Electric Corporation, USA) equipped with a 16-4 MHz linear transducer (4D16L). The following joints and tendon sheaths were examined: anterior, anteromedial and anterolateral talo-crural joint (anterior, anteromedial and anterolateral recesses), posterior subtalar joint (lateral recess), anterior subtalar joint (dorsal and medial recesses), tibialis posterior, flexor digitorum longus, flexor hallucis longus, peroneus, tibialis anterior, extensor hallucis longus, and extensor digitorum longus. For each of these compartments the following US signs of disease were registered: synovial hypertrophy (presence/absence) and joint effusion (presence/absence) according to the OMERACT 7 (Outcome Measures in Rheumatology) definitions for ultrasonographic pathology in inflammatory arthritis . The grade of synovial hyperemia was assessed by a semi-quantitative grading of color Doppler flow, where 0 indicates absence of flow and 1-3 indicates hyperemia. In the talo-crural joint, the synovial thickness of the anterior recess was also measured at 4 locations (proximal and distal on the midline, anterior to medial malleolus, and anterior to lateral malleolus). A mean synovial thickness (MST) was calculated from the 4 measurements at each occasion. The MST values before and after steroid injection were compared with paired t-test. Bone or cartilage erosions were registered if present. For all US-guided injections triamcinolone acetonide 40 mg/ml was used according to local established practice. Dose estimation was based on the size of compartment to inject and the age of the child. Injections were performed by a free-hand technique using a 12-5 MHz linear hockey-stick transducer (i12L). The needle (21 G for joints, 23 G for tendon sheaths) was inserted along the US plane into joint recesses or tendons sheaths. The talo-crural joint was punctured anteromedially (Figure 1) or anterolaterally, the posterior subtalar joint anterolaterally (anterior to the peroneus tendons) - the anterolateral recess of the posterior subtalar joint was found from a coronal plane at the level of the tarsal sinus angling the transducer posteriorly (Figure 2). The talo-calcaneo-navicular joint was punctured dorsally or medially. US-guided steroid injection of the talo-crural joint . The needle is inserted obliquely into the antero-medial recess of the joint (longitudinal US plane). US-guided injection in the antero-lateral recess of the posterior subtalar joint . (A-B) Lateral oblique longitudinal scanning plane at the level of the posterior tarsal sinus. (C) The tip of the needle (arrow) is seen in the enlarged hypoechoic antero-lateral recess (Syn) which is bulging into the hyperechoic fat of the tarsal sinus, between talus and calcaneus (Calc). All patients underwent the same clinical and US assessment before (week 0) and at 4 weeks after the steroid injection. For the talo-crural joint, a decrease in MST of ≥80% was regarded as 'normalization' (inactive synovial tissue). A decrease of 20-80% was considered as 'regression'. For the other joints and tendons, only the presence (no treatment effect) or absence (normalization after treatment) of synovial hypertrophy was recorded. In the follow-up of synovial hyperemia, normalization was defined as total absence (grade 0) of color Doppler flow. At week 0, Doppler US detected synovial hypertrophy, effusion, and/or hyperemia in 121 compartments (joints, tendon sheaths, and a ganglion cyst) (Table 2). Most ankles (n = 32) had involvement of multiple compartments. Synovial hypertrophy was found in 31 talo-crural joints (Table 2), and in 9 of those (29%) it was localized, involving only the lateral, anterior, or anterolateral aspect of the joint (2, 3, and 4 joints, respectively). Isolated talo-crural synovial hypertrophy was found in only 8% (3/40) of the ankles. The compartments most frequently involved in association with the talo-crural joint were the posterior subtalar joint (77%, 24/31) and tendon sheaths (48%, 15/31). Synovial hypertrophy was detected in 26 posterior subtalar joints (Table 2). Only 1 ankle showed isolated involvement of the posterior subtalar joint. In the 12 diseased midfoot areas, synovial hypertrophy was found in 10 talo-navicular joints, 2 naviculo-cuneiform I joints, and 1 tarso-metatarsal V joint (Table 2). Tendon involvement was found in 36 medial, 9 lateral and 5 anterior tendon sheaths. It was multiple in 12 ankles and bilateral in 2. Isolated tenosynovitis, without any joint involvement, was found in only 4 patients. * One ankle with involvement of 2 anterior subtalar joints. ** Twelve ankles with involvement of multiple tendons. Effusion was detected in 40% of the involved compartments, mostly tendon sheaths (33/50, 66%), but also 9 talo-crural joints (29%), 5 anterior subtalar joints (42%) and 1 para-articular cyst. Color Doppler examination showed synovial hyperemia in 108 of the 121 diseased compartments (89%, Table 2). Bone erosions were found in 3 patients, all in the talus. These subjects were 13-15 years old, 2 had polyarticular and 1 oligoarticular arthritis, with disease duration of 6, 102, and 129 months, respectively. US-guided steroid injection was performed in 85 of the 121 diseased compartments, and this was done under general anesthesia in 26 patients (median age 5 years) and with nitrous oxide-oxygen analgesia in 4 patients (median age 15.5 years), according to local practice. Triamcinolone acetonide 40 mg/ml was used for all steroid injections. In joints, the injected dose was 40 mg in 83% (52/63) and 20 mg in the remaining 17%. In tendon sheaths (1 or 2 per patient), the dose was 20 mg in 86% (18/21) and 40 mg in the rest. A dose of 20 mg was injected into the cyst. In 14 of the patients other joints (mostly the knee, but in some also the wrist or elbow) were injected with triamcinolone hexacetonide in the same session. The total steroid dose injected per patient was 40-340 mg (mean 100 mg, median 80 mg). During the study period, 12 ankles had 1 injection, and 28 had multiple injections (2-3 compartments in 25 ankles and 4-5 compartments in 3 ankles). The total time demanded for US-guided steroid injection including general anesthesia, was approximately 30 minutes. The time for injection was 5-15 minutes, depending on the number and sites of injections. Ten patients had involvement of both ankle regions during the study period. In 5 of these patients bilateral symptoms occurred at the same time and both sides were injected in the same session. In 3 patients, new systemic therapies were started at the time of the steroid injection: 2 were previously untreated and were given methotrexate; the other patient had previously received abatacept, which was switched to etanercept. US-guidance of the injection needle enabled real-time visualization of the procedure and quick and effective placement of the needle tip in all 85 of the treated compartments. Table 3 shows the effects on synovial hypertrophy detected in 85 injected and 36 non-injected compartments 4 weeks after treatment, and Table 4 presents the effects on synovial hyperemia in 81 injected and 27 non-injected compartments at the same time point. Considering talo-crural joints synovial hypertrophy was normalized in 55% (17/31) and regressed in 32% (10/31), and there was an overall effect of steroid injection in 87% (Table 3). Quantitative evaluation of MST of the talo-crural joint before and 4 weeks after steroid injection showed a statistically significant decrease (p < 0.001, paired t-test). Normalization of synovial hypertrophy was noted in 93% of the other compartments (Table 3). Normalization of hyperemia (grade 0) was seen in (72/81) 89% of injected compartments, partial regression in 8 compartments (10%) and persistent hyperemia (grade 2) in 1 compartment (1%) (Table 4, Figure 3). There was an equally good result for non-injected diseased compartments in most anatomical sites, except the posterior subtalar joints where synovial hypertrophy was normalized in only 60% and hyperemia in 50%. Effect of US-guided steroid injection in the talo-crural joint as revealed by color Doppler . (A) Before steroid injection there is synovial hyperemia anterior to the medial malleolus (MM). T = talus. (B) One week after steroid injection there is partial regression of hyperemia. (C) Normalization with complete regression of hyperemia 4 weeks after steroid injection. At clinical follow-up 4 weeks after steroid injection 29/40 ankles (72%) exhibited absence of active arthritis and 11/40 had partially improved. The range of motion was normalized in 29/40 ankles, partially improved in 9/40 and deteriorated in 2/40. Ankle pain totally regressed in 29/40 ankles, partially improved in 8/40 and deteriorated in 3/40. In 24/40 ankles (60%), all clinical parameters were completely normalized after 4 weeks. Seven patients had relapse of symptoms and synovitis in the ankle region, verified by Doppler-US, during the 2.5-year study period. Two of these patients had a second relapse, and 1 had 3 relapses. All 7 patients were re-injected with US-guidance. In 4 of the 7 patients, local steroid injection was the only treatment given. Three of the patients were on second-line therapy (methotrexate) at the time of relapse, and in 1 patient methotrexate was added after the relapse. Relapse occurred in a previously injected compartment in 2 patients, in a different compartment only in 4 patients, and in both a previously injected and a different compartment in 1 patient. Relapses occurred after a mean of 6.3 months (median 6 months, range 4-11 months) and re-injections were performed within 1-2 weeks of relapse. Local subcutaneous atrophy was registered in 3 patients (2 two-year-olds and 1 nine-year-old) at 4 injection sites (1 talo-crural joint and 3 tendon sheaths), which represents a complication rate of 4.7% (4/85). No other complications were noted. New disease-modifying therapy for JIA has changed the outcome and increased the need for imaging techniques more sensitive and specific than clinical examination alone. In three recent studies clinical examination and US findings of the ankle in children with JIA were compared, and clinical assessment was found to be inadequate in identifying the structures involved [12, 14, 20]. Several other studies have also shown US to be superior to clinical assessment for the detection of active arthritis, in children [21–26] and in adults [27, 28]. Screening of JIA patients with US have revealed subclinical synovitis in 35-51%, leading to reclassification of patients as having polyarticular disease [12, 20], which is in agreement with a previous report on RA . US is suitable for examination of children of all ages and has certain advantages over MRI [30, 31] being cheaper, mobile, instantly accessible bedside, easy to combine with clinical assessment (interactivity) and non-invasive. It does not require sedation, which facilitates repetitive examinations. Assessment of multiple locations is possible during the same session. Agitation is rarely a problem and young children can be seated in a parent's lap or play while being examined. Modern high-frequency US transducers provide unsurpassed resolution of the superficial musculoskeletal structures in children. An advantage of MRI is its ability to demonstrate bone marrow edema  a predictor of bone erosions in RA , and erosions in difficult-to-assess regions. Doppler-US adds further information by depicting articular and para-articular soft tissue hyperemia [10, 12, 34]. The Doppler signal can distinguish between active and inactive synovitis in RA, correlating to clinical and laboratory data , MRI  and histology . Doppler-US is included in the ultrasonographic definitions of synovitis, tenosynovitis and enthesitis in adult rheumatology . Different gradation systems of Doppler flow are employed, using quantitative  or semi-quantitative  methods. The latter is more frequently used in clinical practice  and the method used in our study. Hardly any data exists on the evaluation of synovial hyperemia by Doppler-US in JIA. Two investigations have demonstrated a correlation between Doppler flow and clinical activity [39, 40]. Early involvement of the ankle region is common in JIA. In a Swedish population-based study 52% of patients with oligoarthritis and 22% with monoarthritis, respectively, had ankle region involvement at the time of diagnosis . It is often assumed that ankle pain and swelling represent talo-crural synovitis, with the occasional exception of very obvious tendon involvement. Our results show the complex distribution of synovial involvement in multiple joints and tendon sheaths (Table 2), in concordance with 2 recent US investigations [12, 13] and 2 MRI studies [17, 41] of JIA patients. The present study is a descriptive interventional study and was not designed to compare results from clinical and US assessments. In our investigation the talo-crural joint was involved in 78%, other studies report rates of 85% , 55% , 61%  and 67%  respectively. In our study the posterior subtalar joint was involved in 65%, compared to 40-77% in earlier reports [12, 17, 41]. Tendon sheaths were involved in 55% of the ankles in our study, compared to reports of 71 and 77% [13, 41]. Tenosynovitis was isolated in 10% in our study, compared to 39%  and 5% . Medial tendons were most frequently involved in our patients, in agreement with earlier findings . All reports of frequent involvement of multiple compartments strongly suggest that imaging, MRI or more easily US , should be performed prior to ankle injections in children with JIA. In US, synovial hypertrophy is detected as solid, non-compressible, hypoechoic tissue in connection to joint lines or surrounding tendons . In children detection is more challenging than in adults as the synovial tissue often is difficult to distinguish from the hypoechoic cartilage of epiphyses. To avoid diagnostic errors, it is therefore important to have good knowledge of the age-dependent normal US appearance of each joint, and to use a meticulous scanning technique that allows clear interpretation of possible anisotropic artifacts. The presence of juxta-articular flow at color Doppler examination in the growing child may either represent normal flow of the well-vascularised cartilage of the epiphysis or synovial hyperemia indicating inflammation. Flow in the cartilage is probably indicating normal cartilaginous flow in contrast to flow inside the synovium which probably indicates hyperemia. In our study one third of the diseased talo-crural joints showed localized synovial hypertrophy with anterior, medial, or lateral localization. Other investigators using contrast-enhanced MRI have also found heterogeneous distribution of synovitis within joints . Our US protocol did not include the posterior aspect of the talo-crural joint, and hence we cannot rule out any localized posterior synovitis. The clinical effect of steroid injection into a joint or bursa depends on accurate placement of the needle tip in the affected cavity. Imaging-guided injections were found to give significantly better results than palpation-guided injections in adult arthritis/osteoarthritis in large and small joints [43–45], in patients with painful shoulders [46, 47] and in children with JIA in the ankle region . To our knowledge, our study is the first to report on US-guided steroid injection in the ankle region in JIA. Common clinical practice in JIA has been to perform a non-guided injection in the talo-crural joint when ankle swelling is present. Injection of the subtalar joint or tendon sheaths is less commonly performed, which might explain the poor outcome of steroid injections for ankle disease in JIA [12, 16, 17]. In our study, US showed no involvement of the talo-crural joint in 22% of cases, and involvement of other compartments in association with the talo-crural joint in 70%. The posterior subtalar joint was the second most frequently involved compartment in our study (65%). This joint is very difficult to inject without imaging-guidance in children [17, 48, 49]. Subcutaneous atrophy is a well-recognized adverse effect of intra-articular steroid injection in children, most likely to occur in small or complex joints such as the wrist or ankle in children under 4 years of age  or with a larger injection volume . Using US-guidance in our study, the needle tip was always correctly localized before injection and possible extravasation of steroid into the subcutaneous tissue was detected immediately. To prevent reflux of liquid into the needle track the needle tip was inserted deeply into the superficially located tendon sheaths, and the needle was flushed with lidocaine before withdrawal. All injections were followed by thorough local compression. Despite these precautions, subcutaneous atrophy did occur in 3 patients. Two of those were very young, indicating that the volume of injected steroid might have mattered. Follow-up of treatment efficacy of arthritis patients may be based on clinical examination and/or imaging. For the talo-crural and posterior subtalar joint clinical examination after steroid injection showed good results in 89% after 1-30 weeks (median 6 weeks, posterior subtalar joint only) , in 82% after 4 weeks , and in 67% after 6 months . These studies are not directly comparable due to differences in design, number of patients, needle guidance technique (fluoroscopy, palpation) and follow-up time. US follow-up after steroid injection  or other treatments  have been reported in several studies in adult rheumatology, but only in a few studies in children [21, 24–26]. All JIA studies have focused on the knee and hip and none on the ankle. Systemic treatment with NSAID, DMARD, or corticosteroid [21, 26] and intra-articular steroid injection [24, 25] showed a decrease of effusion and synovial hypertrophy. Reduction in effusion occurred earlier than decrease in synovial hypertrophy [24, 26]. Our study is the first reporting on US, and Doppler-US, for follow-up of steroid injections in the ankle region in JIA patients. We noted that effusion disappeared completely in the absolute majority of the injected compartments after 1 week. Table 3 illustrates the effect of US-guided steroid injection on synovial hypertrophy, with an overall normalization or regression of 89% at week 4, lowest for the talo-crural joint (87%, Figure 4), and the tendon sheaths (86%, Figure 5), and highest for other joints (91-95%, Figure 6). The somewhat lower result for the talo-crural joint might be explained by the different way we recorded synovial thickness in this particular joint. The large anterior recess of the talo-crural joint is easily accessible to US. Thus we evaluated the synovial membrane of that compartment in greater detail by measuring the thickness at 4 separate well-defined locations, summarizing the results as a single value (MST). This technique enabled detection of small areas of residual synovial tissue which is often seen in inactive synovitis [53, 54]. We considered a residual synovial thickening of ≤20% at follow-up after steroid injection in the talo-crural joint to be normal. US synovial measurement was more challenging in the other smaller compartments i.e. the tarsal joints and tendon sheaths, and hence only the qualitative presence (lack of treatment effect) or absence (normalization) of synovial tissue was recorded. Effect of US-guided steroid injection in the talo-crural joint . (A) T = talus. Synovial thickening (Syn) anterior to the medial malleolus (MM), as shown by US before, (B) 1 week and (C) 4 weeks after steroid injection. There is regression of synovial hypertrophy without complete normalization. 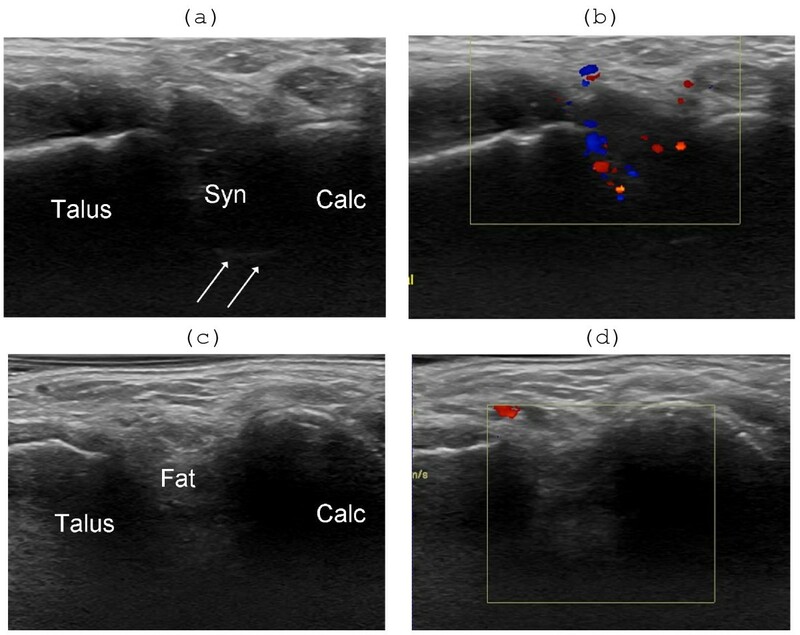 Effect of US-guided steroid injection in the sheath of the tibialis anterior tendon . (A) TA = tibialis anterior tendon, EHL = extensor hallucis longus tendon. Transversal scanning plane before steroid injection. Anechoic effusion, hyperechoic synovial hypertrophy and synovial hyperemia in the tendon sheath. (B) One week after injection there is complete regression of effusion, hypertrophy and hyperemia. Effect of US-guided steroid injection in the antero-lateral recess of the posterior subtalar joint . Lateral oblique longitudinal scanning planes. (A) Before injection there is an enlarged hypoechoic antero-lateral recess (Syn), with distinct deep margins (arrows), bulging into the hyperechoic fat of the tarsal sinus between talus and calcaneus (Calc), and (B) synovial hyperemia at color Doppler examination. (C) One week after injection the recess is not visualized (D) and there is complete regression of synovial hyperemia. Our finding of synovial hyperemia in almost all diseased compartments in the ankle region agrees with recent findings in JIA patients of hyperemia in 93% of symptomatic MCP-joints , but is higher than the 77% detected in symptomatic knees . Doppler-US has become an important technique for follow-up of adult arthritis after steroid injections  or systemic anti-TNF . In JIA only 2 studies have been published, prior to our present study, using Doppler-US for follow-up of systemic corticosteroid  and NSAID  treatment. We also performed US follow-up of the 36 diseased compartments that did not receive steroid injections, which has not been considered in previous studies. In these compartments a high degree of normalization or regression of synovial hypertrophy and hyperemia was noted (Tables 3 and 4). An explanation for this beneficial effect may be systemic absorption of steroid or the presence of anatomical communications between adjacent injected and non-injected compartments. Arthrographic studies have shown communication between the talo-crural and the posterior subtalar joint in 4-16% of adults  but only in 0.5% of children . Normally, there is no communication between the talo-crural joint and peroneal or tibial posterior sheaths, but the talo-crural joint may communicate with the flexor hallucis longus or the flexor digitorum longus sheath in 10-20% of adults  and 1% of children . In our study all the tendons with persistent disease 4 weeks after steroid injection were of the communicating type. Our US examination protocol did not include all compartments potentially causing symptoms in the ankle region e.g. the posterior talo-crural joint and plantar midfoot. A revised and more appropriate scanning protocol for juvenile arthritis that includes these structures as well will be used in the future. Our results highlight the value of US in pediatric rheumatology. US provided exact information of the anatomical location of inflamed structures in the ankle region. The talo-crural joint was not always involved and disease was frequently found in other compartments difficult to evaluate clinically (as the posterior subtalar joint). US enabled exact guidance of steroid injections with a low rate of subcutaneous atrophy, and was well suited for follow-up examinations. Normalization or regression of synovial hypertrophy and hyperemia was achieved in most cases, suggesting that US assessment prior to steroid injection, and US guidance of injections in this region would potentially improve treatment efficacy. Louise Laurell M.D. is a Consultant in Pediatrics at the Department of Pediatrics, Skåne University Hospital, Lund University, Sweden. Michel Court-Payen M.D., Ph.D. is a Consultant in Radiology at the Department of Diagnostic Imaging, Gildhøj Private Hospital, University of Copenhagen, Denmark. Susan Nielsen M.D. is a Consultant in Pediatrics, Department of Pediatrics, Rigshospital, University of Copenhagen, Denmark. Marek Zak M.D. is a Consultant in Pediatrics at the Department of Pediatrics, Rigshospital, University of Copenhagen, Denmark. Mikael Boesen M.D., Ph.D., is a Consultant in Radiology, Parker Institute, Frederiksberg Hospital, University of Copenhagen, Denmark. Anders Fasth M.D., Ph.D. is a Consultant and Professor of Pediatric Immunology at the Department of Pediatrics, University of Gothenburg, Sweden. The authors thank the Foundation for Assistance of Disabled in Skåne, the Gyllenstiernska Krapperup Foundation, the Samariten Foundation, the Petter Silfverskiöld Foundation and the Eva and Oscar Ahrén Research Foundation for their financial support. We are grateful to Wyeth Denmark for providing the US equipment. LL participated in the design of the study, in the ultrasound and clinical examinations, in the acquisition of data, in the statistical analysis and was responsible for the analysis of results and for the draft of the manuscript. MCP participated in the design of the study and in the analysis of results, performed the ultrasound examinations and helped to draft the manuscript. SN participated in the design of the study, in performing the clinical examinations and in revising the manuscript. MZ participated in the design of the study, in performing the clinical examinations and in revising the manuscript. MB participated in the design of the study and in revising the manuscript. AF participated in the design of the study, the analysis of results and in drafting the manuscript.